William Rancic (/ˈræntsɪk/; born May 16, 1971) is a Croatian-American entrepreneur who was the first candidate hired by The Trump Organization at the conclusion of the first season of Donald Trump's reality television show, The Apprentice. He is married to E! News host Giuliana Rancic. Rancic was born (May 16, 1971) in Chicago and grew up in the suburb of Orland Park, Illinois in a family of Irish and Croatian heritage. Rancic attended St. Michael's School (Orland Park) and graduated from Carl Sandburg High School. He earned a B.S. from Loyola University Chicago. His mother is Gail Rancic; his father Edward Rancic died of cancer in 1999. He has three sisters, Beth, Katie and Karen. Rancic was one of the job applicants in The Apprentice 1 during the spring of 2004, as one of 16 contestants. Rancic was hired at the conclusion of the 14-week job interview after Donald Trump selected him over finalist Kwame Jackson. For the final challenge against competitor Kwame Jackson, Trump gave Rancic the task of running a celebrity golf outing at Trump National Golf Club Westchester in Briarcliff Manor, NY, while Jackson was tasked to manage a Jessica Simpson concert. At the final board meeting, Jackson remarked that running a golf outing was the easier of the two tasks, which brought a disagreement from Trump VP Carolyn Kepcher, who was managing a golf course when Trump hired her. Trump hired Rancic. Rancic was the first reality TV star to be hired on national television. He elected to take charge of the construction of the Trump Tower Chicago in his native Chicago, Illinois, on the site of the demolished Chicago Sun-Times building. His other option was to oversee and manage a new Trump National Golf Course and resort in Los Angeles. Originally, Rancic said that after his one-year contract as being Donald Trump's Apprentice expired, he would leave the job and start his own company. He instead opted to remain part of the Trump Organization, and in some seasons filled in as a judge when regular judge George H. Ross was away on business. In September 2007, Rancic co-hosted iVillage's In the Loop with iVillage, a TV show and webcast produced by NBC Universal. NBC commissioned a set at the Universal Orlando Resort in Florida. In September 2008, Rancic began as host for the A&E reality show We Mean Business, in which small business owners undergo business make-overs. In 2008, Rancic and his wife, TV host Giuliana Rancic (née DePandi), started a joint television production company, You and I Productions, which produces reality and scripted programming for television. In 2009, they started their own reality-television show Giuliana and Bill which aired on the E! network. In 2010, Rancic started hosting a news program called America Now, which is broadcast across the United States on stations owned by Raycom Media. The following year, "America Now" was brought back for a second season, with Leeza Gibbons joining Bill Rancic. Originally, the show was on every weekend, but when Leeza Gibbons joined the show, it moved to a Monday through Friday timeslot. In 2012, Rancic became a television spokesperson for the product Rogaine, appearing in national commercials detailing his experience with hair loss. In April 2014, Rancic began hosting the Food Network competitive cooking series Kitchen Casino, where chefs participate in three casino-themed challenges in an attempt to win up to $30,000. In 2016, Rancic published his first novel, First Light, to mixed reviews. In 2009, Rancic sold a century-old Gold Coast row house he had bought in 2007, after extensive renovations. In 2011, Rancic sold a condo on the 50th floor of the Park Tower building, on the Magnificent Mile in Chicago, less than 20 months after purchasing the unit. Rancic had owned a home in Hinsdale, Illinois which prominently featured on his reality show. He sold it in February 2011 after extensive renovations. In 2013, Rancic and his wife purchased a 19th-century house on Bellevue Place, which they rehabbed and sold in 2019. In August 2011, Rancic and his wife entered into a partnership with Lettuce Entertain You Enterprises to open an Italian restaurant in Chicago. The restaurant was named RPM Italian, and it opened in February 2012 in Chicago's River North District. They opened several more restaurants, including RPM Steak in Chicago, another RPM Italian in Washington, D.C., and a planned RPM On the Water opening in 2019 in Chicago. The restaurants have been popular with celebrities, including President Barack Obama and First Lady Michelle Obama. In December 2006, he became engaged to Giuliana DePandi, and the couple wed in September 2007 in Chiesa di Santa Sofia, Capri. On April 23, 2012, Giuliana and Rancic announced on The Today Show that they were expecting their first child via gestational carrier. In August 2012, the couple had a son in Denver, Colorado. Rancic, Bill (2004). You're Hired: How to Succeed in Business and Life from the Winner of The Apprentice. HarperBusiness. ISBN 978-0060765415. Rancic, Bill (2005). Beyond the Lemonade Stand. Razorbill. ISBN 1595141030. Rancic, Giuliana; Rancic, Bill (2010). I Do, Now What? : Secrets, Stories, and Advice from a Madly-in-Love Couple. Ballantine Books. ISBN 978-0345524997. Rancic, Bill (2016). First Light. Putnam. ISBN 978-1101982273. ^ "Bill Rancic Biography". TV Guide. CBS Interactive. Retrieved May 26, 2014. ^ Rothman, Michael (May 16, 2015). "Giuliana Rancic: 44 Reasons I Love Bill on His 44th Birthday". ABC News. Bill Rancic turns 44 today, so no one better than his wife of more than seven years, Giuliana Rancic, to compile a list of 44 reasons why she loves her husband. 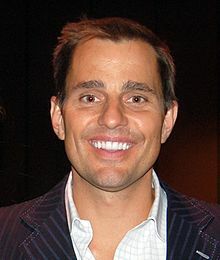 ^ "Bill Rancic profile". The Apprentice Rules. Retrieved August 5, 2012. ^ "Bill Rancic biography". Tvguide.com. Retrieved August 5, 2012. ^ Hall, Sarah (April 16, 2004). "The Donald Hires "Apprentice" Bill". E! News. ^ Kaplan, Don (April 16, 2004). "Trump Picks Up Bill". New York Post. ^ Gyenes, Kelly (April 16, 2004). "The Donald hires Bill as 'The Apprentice'". CNN. ^ "Apprentice Bill Fires Self". E! Online. September 8, 2005. Retrieved February 6, 2016. ^ Fowler, Brandi (October 13, 2012). "Bill Rancic, the Original Apprentice Champ, Returns to the Show". E! News. ^ a b Alboher, Marci (September 9, 2008). "New Reality Show "Fixes" Small Businesses". New York Times. ^ Martin, Denise (July 30, 2009). "TCA Press Tour: 'Giuliana & Bill' not afraid of the newlywed reality show curse". Los Angeles Times. ^ "New to WMBF News: America Now". WMBF-TV. NBC. October 27, 2010. Retrieved May 14, 2011. ^ Nicole Karlis (May 17, 2012). "[INTERVIEW] Bill Rancic Rogaine Ambassador — Exclusive Deets On Hair-Raising Ads". Hollywood Life. Retrieved February 6, 2016. ^ Barger, Jennifer (April 7, 2014). "On Food Network's 'Kitchen Casino,' Bill Rancic holds all the cards". Washington Post (Express). ^ "Fiction Book Review: First Light by Bill Rancic". Publishers Weekly. September 16, 2016. ^ Rodkin, Dennis (July 16, 2009). ""You're Sold!"". Chicago Magazine. ^ Goldsborough, Bob (January 14, 2011). "Rancic flips Mag Mile condo". Chicago Tribune. Retrieved October 17, 2011. ^ Chicago Tribune staff (February 8, 2011). "Trump card: Bill and Giuliana Rancic's Hinsdale remodel". Chicago Tribune. Retrieved October 17, 2011. ^ Goldsborough, Bob (March 18, 2011). "Rancic sells Hinsdale mansion for $4.6 million". Chicago Tribune. Retrieved February 21, 2019. ^ Rodkin, Dennis (February 1, 2019). "Bill and Giuliana Rancic sell on Gold Coast for $5 million". Crain's Chicago. ^ Gomez, Luis (August 29, 2011). "Giuliana and Bill Rancic opening Italian restaurant in Chicago". Chicago Tribune. ^ Lande, Samantha (February 24, 2012). "RPM Italian Now Open in River North". Eater Chicago. ^ Ori, Ryan (March 12, 2018). "Lettuce Entertain You bringing four-level restaurant space to riverfront". Chicago Tribune. ^ "President Obama Dines at Bill and Giuliana Rancic's RPM Steak in Chicago". People Magazine. October 2, 2014. ^ Stoynoff, Natasha (September 1, 2007). "You're Married! Apprentice Bill Rancic Weds E! News Anchor". People Magazine. ^ Nudd, Tim (April 23, 2012). "Giuliana Rancic, Bill Rancic to Be Parents". People.com. Archived from the original on January 14, 2016. Retrieved February 6, 2016. ^ "Giuliana and Bill Rancic Welcome a Baby Boy!". E! Online. Retrieved February 6, 2016. This page was last edited on 28 February 2019, at 06:28 (UTC).